The conjoined twins who were separated at Medical City Children's Hospital in Dallas have left the hospital for an inpatient rehabilitation center. "We are thrilled beyond words that we are here today," the boys' mother Jenni Ezell said Wednesday. The boys were born in July and were connected from the chest to the belly button. They shared a liver and intestines until doctors at Medical City Dallas Hospital separated them a month later. Owen and Emmett Ezell left the Dallas hospital eight months after their surgery and a day after turning 9-months-old. "This is a big day we have been waiting on a long time, we have been ready to bring these boys home for months now so this is a good thing," said the boys' father Dave Ezell. It was an emotional departure for the hospital staff, the team of doctors and nurses who have cared for them in the neonatal intensive care unit since their birth and separation surgery in August. "I just can't thank them enough we are so happy and grateful," said Jenni Ezell. "They are like family to us. It is hard to say goodbye until later." While at rehab, the boys' parents will learn to manage those tubes until the boys can eat on their own. "When we first learned they were conjoined we never imagined, that we would be here but it has come and it is time now time to keep loving them and watching them develop and grow," said Dave Ezell. "We are in charge of their care, we get to take care of the babies. So it is like the beginning of this whole new world for us, where it is going to be physically exhausting, it's going to be amazing." The Ezells home the boys can go home for good in a month. The family has been chronicling the boys' progress, since their separation surgery in August 2013 on The Ezell Twins blog. 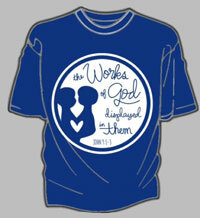 The Ezells are selling T-shirts through their blog that read, "The Works of God Displayed in Them, John 9:1-3." The funds donated go into a trust fund set up for Emmett and Owen and their direct care.